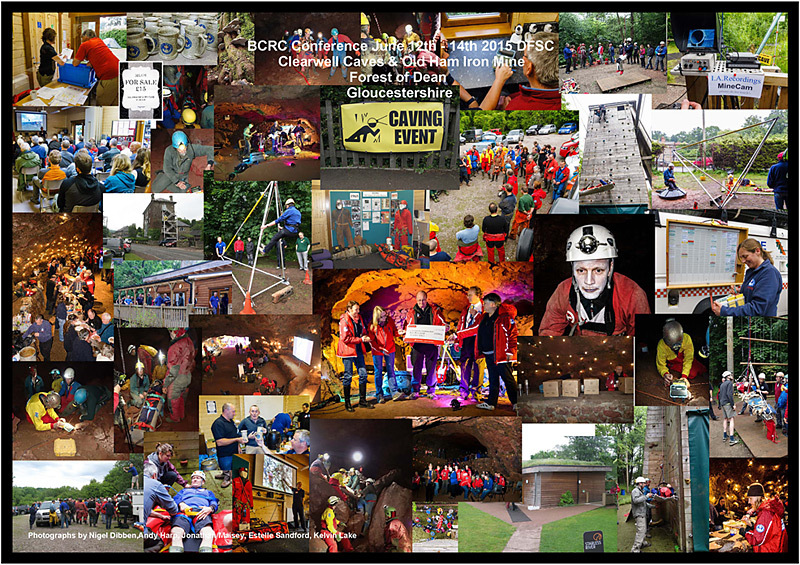 The joint BCRC Conference and BCA Party weekend was held over the weekend of 12-14 June 2015 at the excellent “Dean Field Studies Centre”, in the heart of the Forest of Dean. We would like to thank everyone involved, be they attendees, workshop providers or the hard working catering and bar staff for making the weekend such an enjoyable event. Judging by the feedback that we have received everyone enjoyed themselves! The mix of seminars, discussions and underground activities worked well, giving members of various rescue teams and non-team members to meet, swap stories, ideas and techniques. Over 100 people were involved in the Rescue Practice at Old Ham on the Sunday, and we didn’t seem to loose anyone! . Any profits from the event will be shared between the organising cave rescue teams, GCRG and MCRO. A collage of some of the photos taken during the event has been produced as an A3 PDF (2Mb in size) – the picture below links to it if you want to download it. If you took any pictures or videos during the event and haven’t yet sent them to us, we would very much like to see them as a record of the event. If you need to contact the BCRC, please use the Contact form to send a message to the Secretary.